On the 29th December 2003 at 10 a.m. I intend to set out on an extraordinary Art performance that could take up to 9 months to complete. 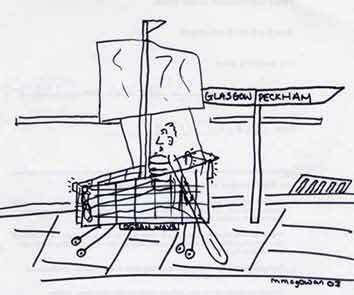 I will be attempting a solo, single-handed, row/sail non-stop from Peckham Library in South-East London to Glasgow in Scotland using a supermarket shopping trolley. The journey is over 400 miles long. All I will have to propel the vessel is a single oar, but I am also planning to use a mast and sail so as to make use of any northerly winds. I will row the trolley by pushing the oar on the pavement, one side at a time, trying to keep the wheels straight, which could be a problem, there will be flashing red beacons attached in accordance with vehicle/vessel regulations. I am not sure about going up and down hills. Along the way I will be collecting gifts from English people to hand out to the people of Scotland and Glasgow. The performance/event I see as a kind of reconciliation for the William Wallace thing. A kind of peace keeping/goodwill mission to try and bridge the English, Scottish divide. I want to try and bring these two great countries back together. Ever since the problems with William Wallace there has been so much hatred. I see this expedition as a bringing together healing trip. The weather conditions could initially be quite severe, it being winter, but I intend to dress appropriately with waterproofs and a life jacket, conditions should be better on my arrival in late summer. I also intend to sleep in a bivouac and will be bringing a compass to navigate and a flask, for hot drinks. After a short circumnavigation of central London I will be heading north parallel to the A1 but using only B roads. On the journey I will be singing Rod Stewart's timeless classic, 'I am Sailing' to keep my spirits up. I see this voyage as following on in the great tradition set by adventurers such as Sir Francis Chichester, Sir Ranolph Fiennes and Sir Richard Branson, all pioneers. I would also like to align myself with Nelson, Ferdinand Magellan and Ellen Mc Carthy, all like myself hardy sailors. The title of my vessel, The Ocean Wave II, is in memory of Bas Jan Ader, a Dutch artist who died while trying to sail the Atlantic as an art performance, from America to Europe. His small boat, the Ocean Wave, was found upturned off the coast of Ireland, his body was never found. The work was entitled ‘In Search of the Miraculous’. I hope to complete 2 miles a day, which means the voyage should take 200 days, just under 7 months. But I am allowing up to 9 months to complete the performance, to cope with any problems which I may face along the way. I have given up all my commitments to focus on this event. I have no support or back up team, but will have a small limited budget to sustain me as I head north. I am very excited about this adventure. Pushing a monkey nut along the road with my nose for 7 miles and sitting in a bath of baked beans with two chips up my nose and sausages strapped to my head for 100 hours will stand me in good stead for this adventure, which is surely my most challenging to date.